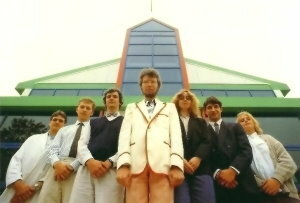 ST Robotics was formed in 1989 by David Sands (center picture) after 4 years of development along with Catherine George (3rd from right) of low cost bench top robots for professional applications. Our mission: ST aims to provide robots that are easy to set up and use, easily programmed by any individual regardless of experience. We provide unlimited support all through the learning experience. We equally aim to provide a low cost solution to experienced users for a diverse range of advanced and complex tasks. Our reputation is one of unconditional customer support, flexibility, and products of quality and total reliability. Robotics Within Reach is a maxim thought up by a past colleague Simon Crowhurst (3rd from left in picture) in around 1989. It encompasses 3 concepts, within reach technically (easy to use), within reach financially (affordable) and reach (distance) as it applies to an arm. ST Robotics is a trading name for associated companies in USA, UK, Russia and Sri Lanka. The company was formed in 1985 with the objective of producing low cost "bench top robots". Sands Technology International Inc. t/a ST Robotics based in Princeton, New Jersey. Incorporated in 1992, CEO David Sands. VP Annis Monforte (far right). ST Robotics Ltd. t/a ST Robotics based in Cambridge, UK. a continuation of Imagecroft Ltd., first incorporated in 1986. Association Robot Ltd. based in Ekaterinburg, Russian Federation, incorporated 1992, currently dormant. ST Robotics Asia Ltd, Sri Lanka, managing director Ravi Kumara. All robots are made in the UK apart from Cartesian systems made in Sri Lanka. ST Robotics is the ONLY manufacturer of robot arms in the UK. If you search for this you will find a number of companies but none of them actually makes robot arms. They are integrators or resellers of imported robots. 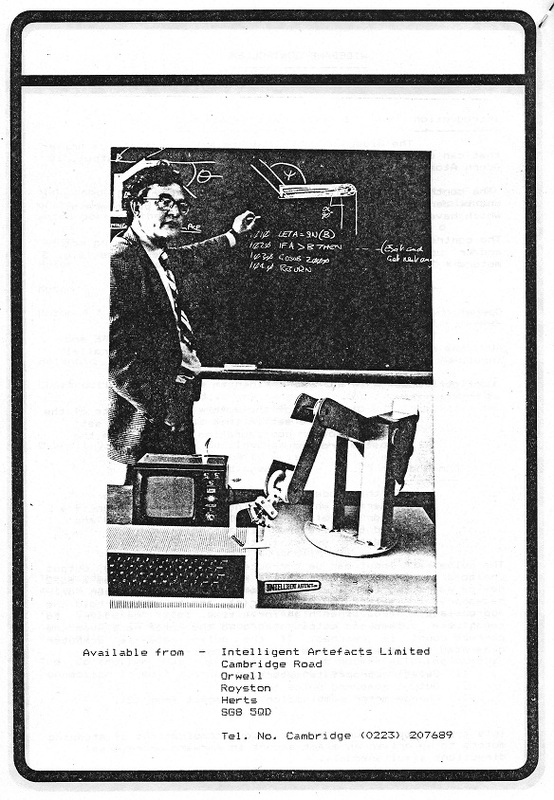 Peter Krueger worked for David Sands' company Intelligent Artefacts in the early 80s. He designed the first robot arm, the SA1 using stepper motor technology devised by me. He did the mechanical design and I did the electroncs. Peter was in charge of production but production was not keeping up with orders. Peter seemed to spend a lot of time on software and on the phone. This was because the software was full of bugs and he was fielding complaints from customers every day. Eventually I told him that unless he caught up with production Intelligent Artefacts would run out of money and I would have to close the company. He didn't so I did. A business partner Max Ahmed of Medco offered him a job which he didn't take. So I gave him a month's notice. After Intelligent Artefacts closed David Sands designed the Cyber 310 with the same technology. Peter has written a whole long article which clearly shows he bears a grudge after all these years. Karspeak was a spin off from the Speakeasy speech synthesiser. Unipart were interested but after BMWs experience did not go ahead. Therefore none were sold and no-one stabbed their cars with a screwdriver. Commodore Pet computers were purchased from a legitimate California distributor and were not on any "grey market". They were unreliable but that was down to Commodore's quality control. All warranty claims were honored. Peter Krueger was given the role of general manager of Intelligent Artefacts. Willy Miller was general manager of Sands Whiteley, the parent company. Hence the chain of command that Peter seemed to resent. I (David Sands) never wrote an accounting program. That was written by Rod Starksfield. 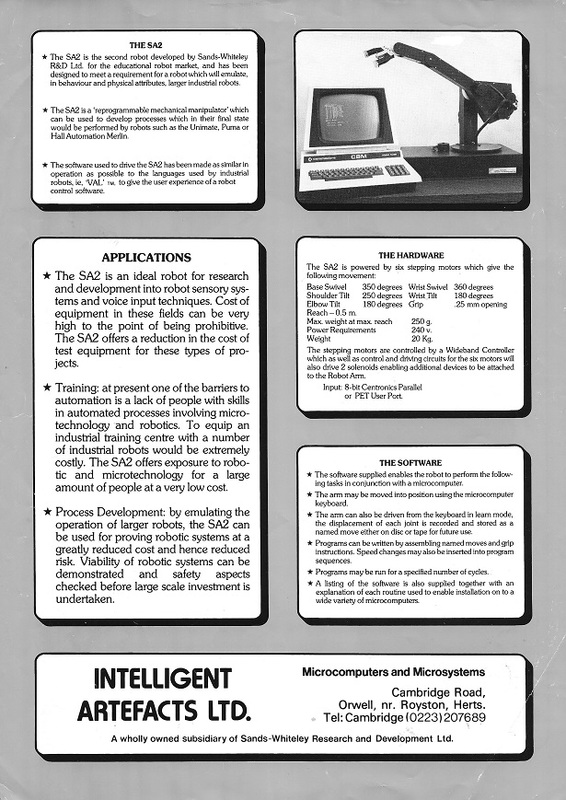 Sands Whiteley engineers did not develop any S100 cards, they were all on Eurocards. Karspeak did not divert resources from Speakeasy but was an excellent way of getting publicity including ITV News at Ten. We knew Speakeasy's market very well. It was for schools and colleges as a way of understanding the structure of speech (phonemes etc) through a system called Arpabet. I provided an acclaimed manual for this sole purpose. No other use ever appeared. Robot vision was never going to be big and is still a very small sector even today. I don't recall any stand-up rows with suppliers. The SA1 arm was redesigned to the SA2 to be easier to make. It was very low tech. made from simple folded sheet metal. The anecdote about me pacing the room while Peter was writing software was probably true. The software was buggy in the extreme. Almost every customer complained and Krueger spent ages trying to debug badly planned software written in BASIC. There were things like "no such line number in line 1000" etc. After Peter left I got all the flack from customers. It was then I spent an intense week writing the first RoboForth. After that whenever a customer called with a complaint I just mailed them a copy of RoboForth and I never heard from them again. RoboForth was also considerably faster than the BASIC software resulting in a much faster robot. Regarding the letter from me to Stevenage Council Peter found this by rummaging in the bin. Since it was in the bin it clearly was not posted. However if I am asked for a reference I have an obligation to give an honest and confidential answer.